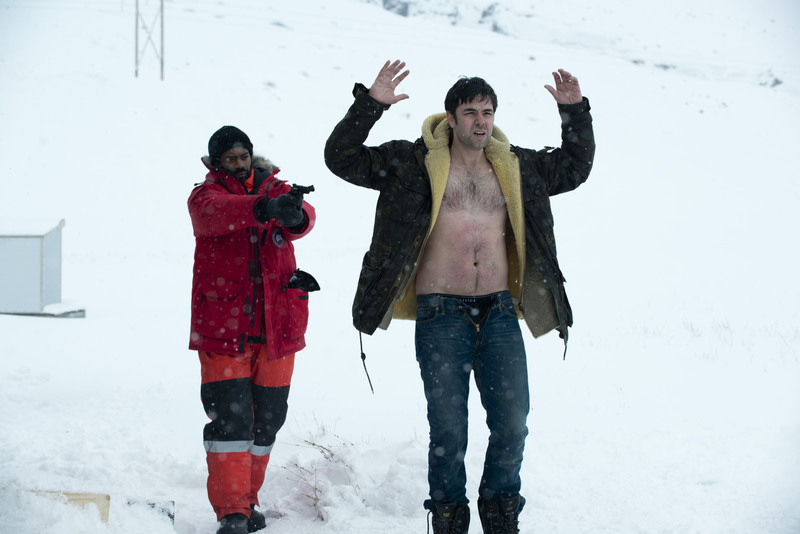 ‘Fortitude’: Where everyone’s looking for a little warmth! After the giant boulder of characters thrown at us in episode 1, the second episode focuses more on Stanley Tucci and Sofie Gråbøl‘s characters and their dogged determination. DCI Morton is still getting a cold reception from the local police having to bargain and bribe his way into the investigation. Sheriff Dan Anderssen instructs his team to keep Morton out, but Morton in his short time in Fortitude has already established the strengths and weaknesses of it residents; threatening to expose Eric’s affair with Stoddart’s wife to gain footage of the interview room and charming Ingrid into thinking she’s in charge of a forensic scene she obviously hasn’t got a clue how to interpret. Hildur meanwhile is doing her own detective work. She’s less interested in Stoddart’s murder and more interested in what he discovered and making sure nobody finds out. After comforting and putting his grieving wife Trish to bed, she deletes a voicemail from her phone in which Stoddart mentions how his find will change everything. Henry is quick to catch on to the fact she’s probably already invested a lot of money into the new hotel, so is well aware her interest is not exactly legit. There’s also an awkward dinner scene with Hildur, her husband Eric and Trish. Does Hildur know they’ve been having an affair? The residents of Fortitude may all be “running away from something” but they’ll all running to someone other than their partners. Despite wallowing in his guilt Frank is still sleeping with Elena, while his wife holds vigil at her son’s bed (well, chamber). Anderssen is still hovering outside Elena’s door hoping to get lucky. And then we have the missing scientist Natalie who turns up at a research cabin with Jason. Her explanation of “It’s cold, we get close” alluded to the fact he’s not the only person she’s sleeping with. It does beg the question if Jason was already sleeping with Natalie why did he need to take the Mammoth tooth to Stoddart in the first place? As Stoddart’s co-worker could he not have gone through her? I’m not quite sure how the law works in Fortitude when suspects (Natalie and Vincent) are both used to help the police find and test evidence. It’s still difficult to determine if there is meant to be supernatural elements to the series. As I mentioned in the episode 1 recap, it certainly seems to have been insinuated but apart from the line about nobody can die in Fortitude because the ice preserves disease making it a “forensic treasure house” there’s been little mentioned this week. Episode 2 was less engaging than the first but improved its focus on fewer characters making it a less overwhelming overload of who’s connected to who. Despite very little really happening there is enough titbits of information to keep me engaged for the future episodes as well as the real star of the show: that wonderful scenery!